Weeks ago a blogger by the name of Larry Johnson started touting news of a "video" of Michelle Obama ranting against "whitey", meaning whites in America, but no one has produced such a video. Speculation has run rampant about the existence of the tape. Larry Johnson runs the No Quarter blog and he has claimed to have spoken to people who have seen the alleged "whitey" tape, but the buzz around the web and even in the media has been whether this tape exists and what exactly was said on it. Little bits of information have been put out there, at a time, but nothing concrete enough to be anything but rumor. Rumor perhaps, but enough of one that strategists on news media shows have also been speculating about it, which in this day and age, makes it news. Indeed, rumors are swirling on the campaign trail that a new video will soon surface featuring Mrs. Obama appearing on a panel with radical speakers during which she makes more controversial statements. With so many news media outlets and bloggers alike as well as political operatives trying to establish whether the tape exists and if it does, what exactly is on the tape that has been called "stunning" and whether it would actually damage Barack Obama beyond repair. Barack obama has had to quit his church of over 16 years because of controversial racial statements made by not one, but two, of the people he has called his spiritual guides and/or advisers and has publicly stated he considered his "moral compasses". He has been linked to questionable characters and this alleged tape is being reported as another link, this time to Louis Farrakhan. Farrakhan has been the center of much controversy, and critics contend that some of his views and comments have been racist, homophobic, and antisemitic and he is also known well for his ties to The Nation of Islam. You can see Farrakhan ranting against Jews here at YouTube. Today the Canadian Free Press reports that speculation says the item in question, which could be a dvd and not a video, was obtained by the Rudy Giuliani campaign originally and leads us to a website called HillBuzz for more information about what is allegedly on this tape or dvd. HillBuzz claims that the video is actually a dvd that Trinity United sold on its website and is no longer available from that location. For about 30 minutes, Michelle Obama launched into a rant about the evils of America, and how America is to blame for the problems of Africa. Michelle personally blamed President Clinton for the deaths of millions of Africans and said America is responsible for the genocide of the Tutsis and other ethnic groups. She then launched into an attack on "whitey", and talked about solutions to black on black crime in the realm of diverting those actions onto white America. Her rant was fueled by the crowd: they reacted strongly to what she said, so she got more passionate and enraged, and that's when she completely loses it and says things that have made the mouths drop of everyone who's seen this. HillBuzz also says the time period for this alleged dvd was from June 26th - July 1st 2004 in Chicago, IL at the Rainbow/PUSH Coalition Conference at Trinity United Church: specifically the Women's Event and that Michelle Obama appeared as a panelist alongside Mrs. Khadijah Farrakhan and Mrs. James Meeks. They also suggest that this speculation and rumor surrounding the dvd's existence and the content could easily be proven or debunked by the media simply by pulling the tape of the 2004 Conference from their archives and determining if this is the speech in question. Other speculation from the media and blogs, from the right and the left, is that this whole thing is simply a hoax or that Michelle Obama's words have been severely overstated and exaggerated. Then you have Barack Obama supporters that are already trying to explain how Michelle Obama's words could have been misunderstood, IF the dvd or video even exist. Sort of a preemptive "excuse" about an item that no one really even knows the truth of whether it it even exists or not. Why did Bush cut folks off medicaid? Why did Bush let New Orleans drown? Why did Bush do nothing about Jena? Why did Bush put us in Iraq for no reason? Why'd he cut folks off medicaid? Why'd he let New Orleans drown? Why'd he do nothing about Jena? Why'd he put us in Iraq for no reason? Whitie cut folks off medicaid? Whitie let New Orleans drown? Whitie do nothing about Jena? Whitie put us in Iraq for no reason? What we know as facts at this time is that Larry Johnson from No Quarter has whipped up a media and blogosphere frenzy, to the point where people have crashed his servers with traffic, all trying to find out more about a dvd/video that might not even exist. Another fact is he has managed to spread a rumor that has now been mentioned in the Wall Street Journal, The Telegraph, Fox news, radio shows, the Houston Chronicle and dozens of other organizations, which are talking about something which may or may not even exist. 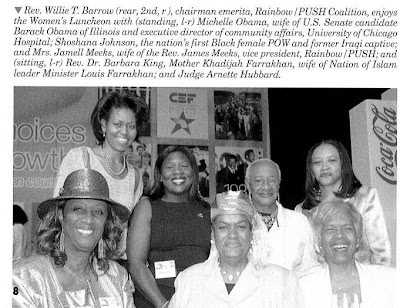 We also know that there is a photo (shown above) of Michelle Obama at the Rainbow/PUSH Coalition 2004 Conference, where she is captured in the photo with Shoshana Johnson, the nation’s first Black female POW and former Iraqi captive, and Mrs. Jamell Meeks, wife of the Rev. James Meeks, vice president, Rainbow/PUSH, and Rev. Dr. Barbara King, Mother Khadijah Farrakhan, wife of Nation of Islam leader Minister Louis Farrakhan, and Judge Arnette Hubbard. Frankly, all that photo proves is something that everyone already knows and acknowledges and that is that they were at the same event at the same time and someone took a picture. In the hours and hours I have spent reading media reports mentioning this alleged video and bloggers opining on whether or not it exists and if it did exists what she "meant" or that her words were misunderstood, I have seen few legitimate questions. Why can't Michelle simply state "I have never used the word 'Whitey' to denigrate white people"? After all, this story is being covered around the world. Why the silence? The next question that some would consider legitimate would be about the original source of the alleged dvd or video or the "rumor" that something like it existed. Now, ponder who could have this DVD that was being sold at Trinity Church? Well the first person that comes to mind is the Reverend Jeremiah Wright! Maybe that is why he was smiling so much last month as he went on his Bust-Obama media tour? Maybe the price for his 3 days of fame, provided partially by Clinton supporter Barbara Reynolds, was the DVD of Michelle and Mrs Farrakhan? I would add a third question to that short list and that would be, why are media outlets speculating on the damage this dvd or tape that might or might not even exist, do to Barack Obama, instead of asking who started the rumor, who told Johnson there was a video to begin with and why we, the people, have still not seen the actual footage as of yet? Washington and politicians are not known for their ability to keep secrets nor keep something explosive under their hats. One last question..... Is the mere possibility that this incriminating dvd or video exists the reason why Hillary Clinton did not concede last night? Does she know something or is she simply hoping against hope that this alleged tape will be published before the Friday deadline that the Democratic leaders have set for the superdelegates to announce their choices.